This afternoon I took a little time to work on some changes in Acire; my little graphical front-end to a library of Python Snippets. I wanted to share this work as I think it will continue to help Acire be a useful little tool. Because of the status bar the buttons no longer appear in the lower left corner of the window. That looks kinda odd to me. Why not just list the number of available snippets in a text label beneath the list instead of using a status bar? Or just not display the number at all. Is it really that interesting, anyway? I don’t understand what you mean about buttons no long being in the lower left corner of the window. There have never been buttons there? I agree that the number of snippets is not hugely useful, but I felt like it was nice to show it as future versions of Acire will download updates periodically and I will use the status bar more. I think Søren meant the lower right corner. The status bar is below the buttons, pushing them away from the corner by the height of the status bar. I agree that they would look better if they were at the bottom of the window. Yes, sorry, I meant the lower right corner. So the buttons have always had a status bar below them – as you can see at http://farm5.static.flickr.com/4015/4257121997_3a41684247_o.jpg – the status bar was just not used. Hey, I’ve just tried Acire, and think this app is a great idea. Just one thing I ran into, that I would like to mention, and since I am not sure where the bug report page is, I thought I would mention it here. When first I installed the app from the PPA it wouldn’t work, so I ran the app from the terminal, and it said I needed python-gnomeprint. 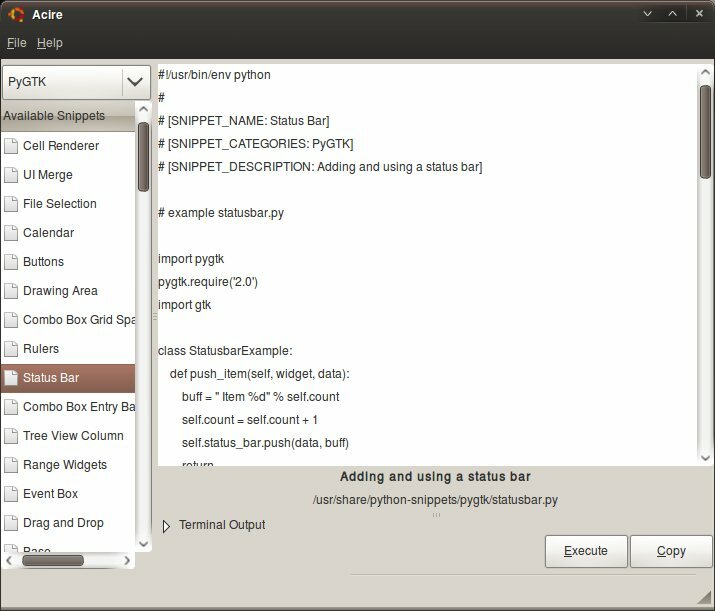 I installed this package, and after that the app ran fine, so it seems you need to add python-gnomeprint to the list of dependencies. Yeah, I have noticed a few dependency issues. I need to figure out how to ensure Quickly remembers dependencies it can’t detect. I think there just needs to be some kind of horizontal line above the status bare, at the right of the list. Then it wouldn’t look that odd. You never tought of including other languages than python ? Indeed this has been thought of, and we have a plan. I think it’s mainly strange because it’s a label and not a real status bar widget (thus it misses the separator and makes it look like the buttons are positioned wrongly). The reason the line doesn’t show I think is down to a theming or spacing change – see http://farm5.static.flickr.com/4015/4257121997_3a41684247_o.jpg for an old screenie. I don’t think writing a plugin in addition to a standalone app makes sense. I guess the app makes sense to make it more visible, and easier to promote, but I think a gedit plugin would have been more useful for users. 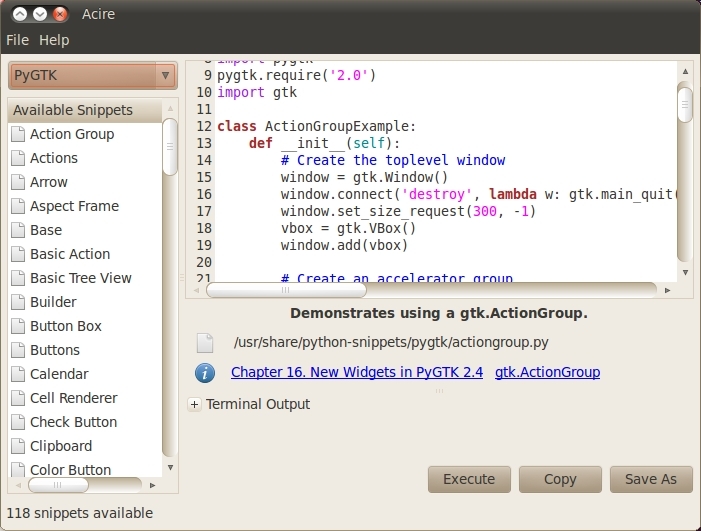 Looks good — it would be nice to see if a plugin for emacs or vim can be made somehow too. I used Acire, and one thing I found it was lacking was a Search feature. Although the alphabetized list makes it a little easier, I don’t always know what I’m looking for right away with the GTK terminology. 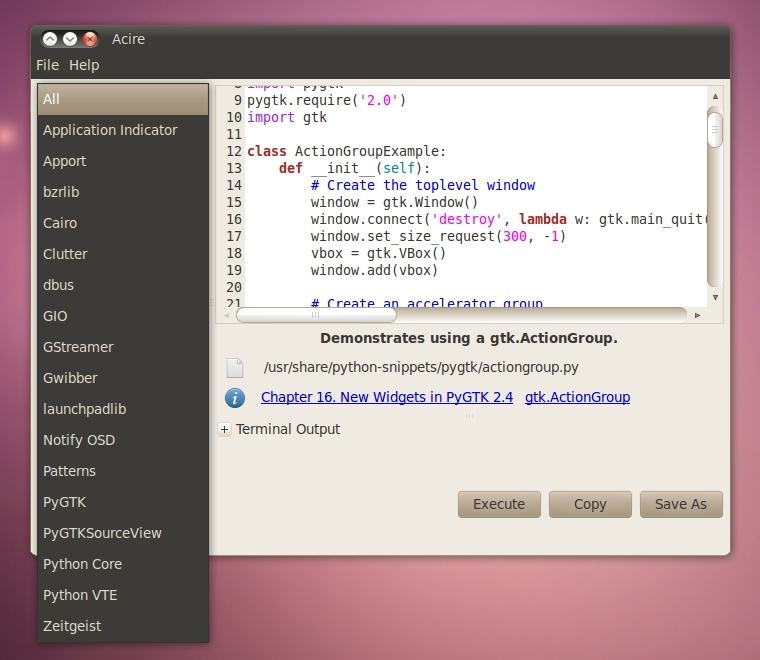 Hi, very nice app, but is this not meant to be used in other distributions beside ubuntu? Can I download somewhere tarball without using launchpad, ppa and bzr? Sure, it can be used in any distro – it just needs someone to package it.